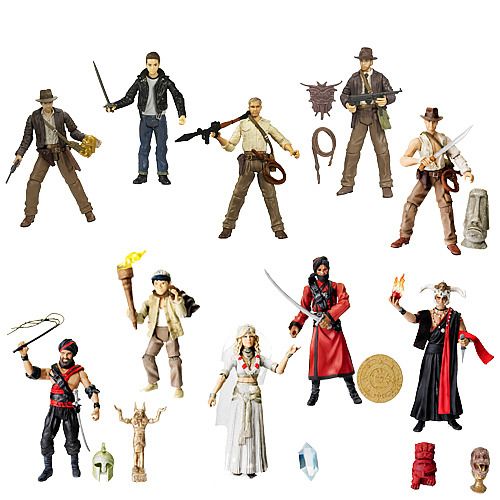 Shopping for Indiana Jones Action Figures? Take a look at our huge selection of Pop! Vinyl Figures, Action Figures, Statues, Key Chains, Construction Toys, and Mini-Figures! Assortment changed by the manufacturer June 27, 2008. "Throw me the idol. I'll throw you the whip!" Special bonus "relic" with each figure! Create your own globetrotting adventures! Indiana Jones' adventures have covered the entire planet and involved dozens of mysterious artifacts, some seemingly more valuable than life itself. Hasbro celebrates this exceedingly well-received movie series with collectible action figures based on the films! Each realistic, 3 3/4-inch character features authentic clothing and accessories, and includes a special bonus "relic" right from the silver screen. You don't have to risk tossing your whip to anyone in order to acquire these figures and their idols. Simply add this item to your cart... and enjoy! Collect all the Indiana Jones Action Figures and create your own globetrotting adventures!